Following from the previous three posts – on Paul Thomas Anderson’s career, the two main characters of The Master and the Master’s wife and his self-improvement cult – we’ve arrived at the fourth and final instalment of this series. Mege Let me ask you this: Roger Ebert said “when I reach for it, my hand closes on air” with this movie. I know what he means, but in my opinion, he goes too far. The film is puzzling, but not to the extent that we are left with a lot of hot air. How do you see this? Matt I’d agree with you. I find the film fascinating, confounding, perplexing, but I definitely wasn’t frustrated by all the questions it’s left me with. Like There Will Be Blood before it, I mainly felt that I’d seen something disconcertingly, intriguing different than what you usually get in American cinema. Yes, there are echoes to Kubrick, to ’70s filmmaking, and probably to lots of other things I didn’t even register, but there is still something entirely original about the film, its characters and what it evokes in me. It doesn’t make for comfortable viewing, but there’s enough of that already, I’d say. Mege And another question: We know that PTA likes his music. Boogie Nights knows how to use the music of the era almost to perfection, Magnolia is based on several Aimee Mann songs. In The Master, many characters start singing songs for various reasons, not all of them clear. It’s probably one of the weirdest aspects of the movie, so is there anything that struck you about the singing? Matt Well, for one thing, Phillip Seymour Hoffman’s singing creeps me out! Seriously, though: while I find Dodd the less puzzling of the two main characters, his serenading Quell with “Slow Boat to China” is extremely odd. There’s something about it that is moving, yet it’s also weirdly threatening – and I can’t imagine anyone other than Hoffman to pull off that particular scene. Music is definitely something that PTA obviously cares about, though his approach has also changed since Magnolia and Boogie Nights. I mentioned Kubrick before, and in both of the more recent films (though more so in There Will Be Blood) I heard echoes of some of Kubrick’s choices – György Ligeti’s less-than-whistleable ditties spring to mind. The Master‘s orchestral soundtrack has moments where it feels like a talented alien with no understanding of earth musicology has listened to a bunch of early 20th century music and then done his own, alien take on it. What was your reaction to the orchestral soundtrack? Mege You got me. I am very difficult when it comes to musical scores. This time around, I only remember the weird guitar twang, and I would have to watch the movie again, concentrating on the score, in order to answer properly. – Maybe the music has strong ties to the mood of the movies we’ve mentioned: Boogie Nights and Magnolia have kindness and good intentions towards most of their cast, while There Will Be Blood and The Master focus on the dark side of human nature. The guys in Boogie Nights really thought they were making art – they weren’t, and the music reflects that. Stuff like “Jungle Fever” is a musical catastrophe, but it’s full of atmosphere, and there is no other song that brings that time to life more quickly. The Aimee Mann songs as well as the Jon Brion score from Magnolia sound like there is hope for most of its characters. And if I say that the music in There Will Be Blood is dreadful, I don’t mean it’s very bad, I mean it’s full of dread. I guess Dodd tells Freddie goodbye with that song. They met on a boat, so it’s only fair that their farewell should include a boat. I agree that the singing is weird, but (this is a long shot) there is nothing quite as appealing to your subconscious as a song. Remember what happened to Freddie when the Master sang and danced through Mildred Drummond’s house? Freddie started to see all of the women as if they were naked. They have music during a break in the presentation of The Split Sabre (it’s actually Melora Walters’ voice we are hearing). Music is a great means of manipulation. Matt Time for a final question: I just Googled for PTA’s future plans – and apparently he’s adapting Thomas Pynchon’s latest novel, Inherent Vice. IMDB summarises the plot as follows: “In Los Angeles at the turn of the 1970s, drug-fueled detective Larry ‘Doc’ Sportello investigates the disappearance of an ex-girlfriend.” The cast includes Joaquin Phoenix, Owen Wilson, Reese Witherspoon and Benicio Del Toro. What do you foresee: a return to the earlier drug-addled world of Boogie Nights, something dark, strange and full of dread such as PTA’s more recent films – or is it futile to try and predict what Anderson will do next, doubly so if it’s based on a novel by Pynchon? Mege No idea – and I mean that in the best possible sense. I like filmmakers who take risks, and PTA has the ability to puzzle thoroughly, for instance with giving Adam Sandler the lead role. I am completely open, but for the record, adapting a Pynchon novel must be hard work by itself. What do you think? 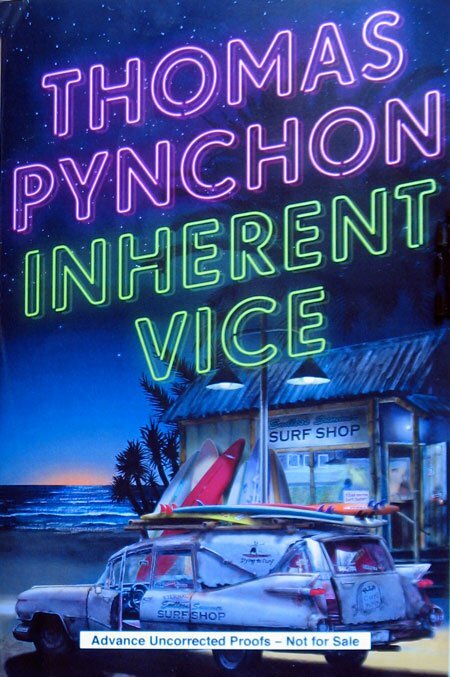 Matt Apparently Inherent Vice is Pynchon’s most approachable novel – which, I expect, is still pretty much bugshit crazy postmodern goodness. From the sound of it, the material is funnier than Anderson’s last two films, which aren’t devoid of humour, but it’s of a pretty grim sort. (“I drink your milkshake!” comes to mind as both hilarious and horrific.) Perhaps he will reinvent himself again, or perhaps we’ll see what the missing link between Magnolia and The Master might look like. In any case, I’m definitely looking forward to the film and to Anderson’s continued career! And that’s it! Thank you for reading our series on The Master. We don’t have any definite plans yet for future conversations along these lines, but we’re definitely hoping to return to this format at some point. Any comments on these posts and how we can improve them are very welcome.